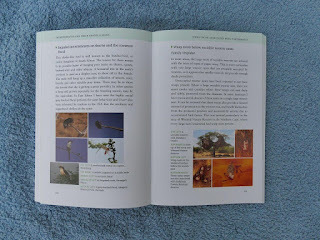 There is an abundance of wildlife books available for our Southern Africa region. Books about trees, plants, mammals, birds, reptiles, insects, and more. 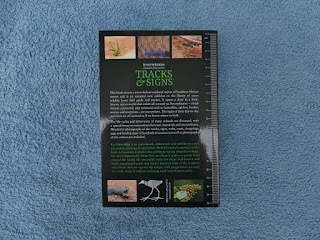 There are also a number of books about the tracks and signs of our famous mammals, even snakes. 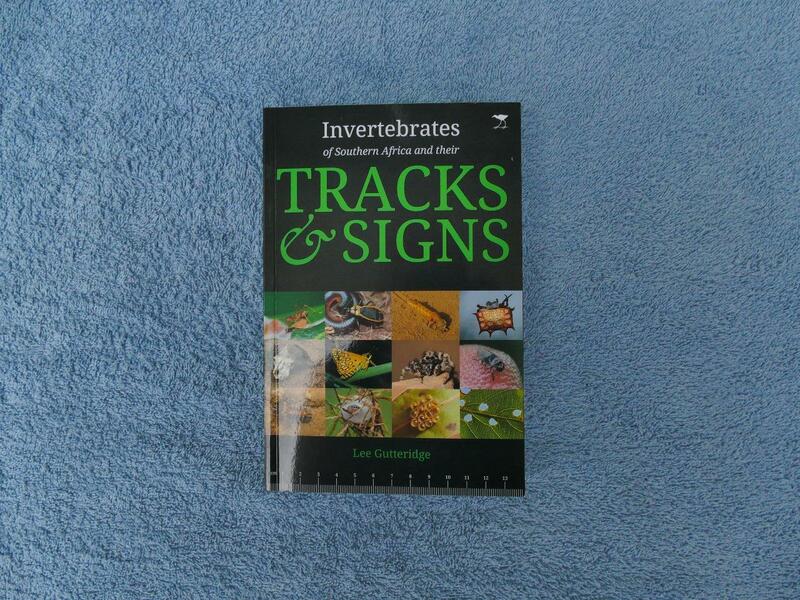 But this book about the tracks and signs of the invertebrates in our region is definitely a first, a very welcoming first. Invertebrates are creatures with no spinal cord. There are many different orders and families of invertebrates. Examples that laymen encounter daily are insects, spiders, scorpions, snails, leeches, ticks, worms, millipedes, jellyfish, mites. 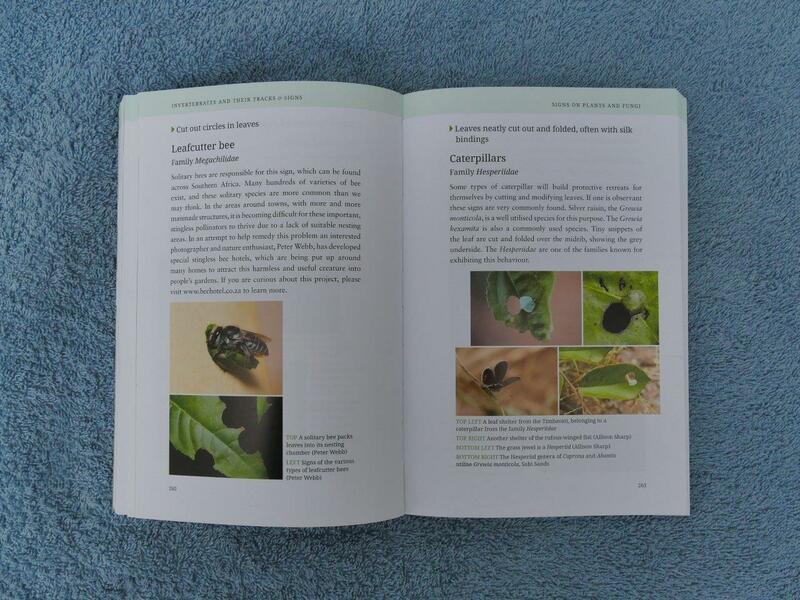 This book provides written insight into the different invertebrates tracks and signs, life cycle information, interesting facts, distribution of species, preferred food plants, predatory behaviour. Where possible, all of this is illustrated with numerous, detailed photography. 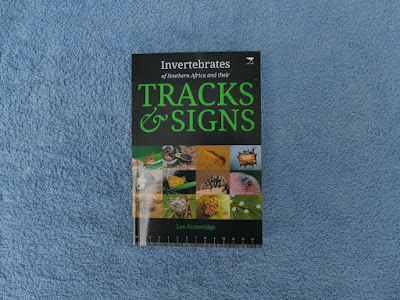 It is not an invertebrate identification field guide per say, but rather a guide to the identification of signs and tracks left behind by the creatures, which should lead to the identification of specific invertebrates. An interesting example of the diversity of the book is the description of the jumping beans of the Tamboti tree. It is actually caused by the caterpillar of a tiny snout moth species which lives inside the seeds. When exposed to warm sun, it flexes its body inside the seed, causing it to ‘jump’ to a cooler, shadier place. The book starts with a description of the different locations the author visited to do research for the book. Explanations are provided why specific regions were visited, linking them to the 9 major biomes of Southern Africa. The rest of the book is organised according to the different tracks and signs one can expect to find, such as ‘Tracks and Trails in Sand’, ‘Signs on Plants and Fungi’, ‘Droppings and Frass of Invertebrates’. Within each chapter there are sub-headings based on the variation of signs. The author used this approach to justify why an index was not included in the book. In my view, this (index) is sadly missed. 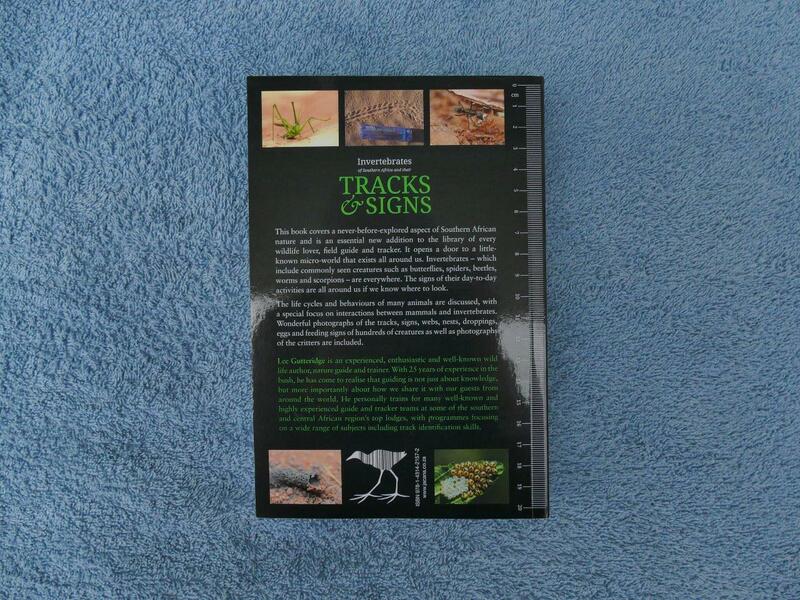 It may be possible to find the right description when a sign/track is spotted in the field, but I expect the book will also be consulted for signs/tracks of specific invertebrates. 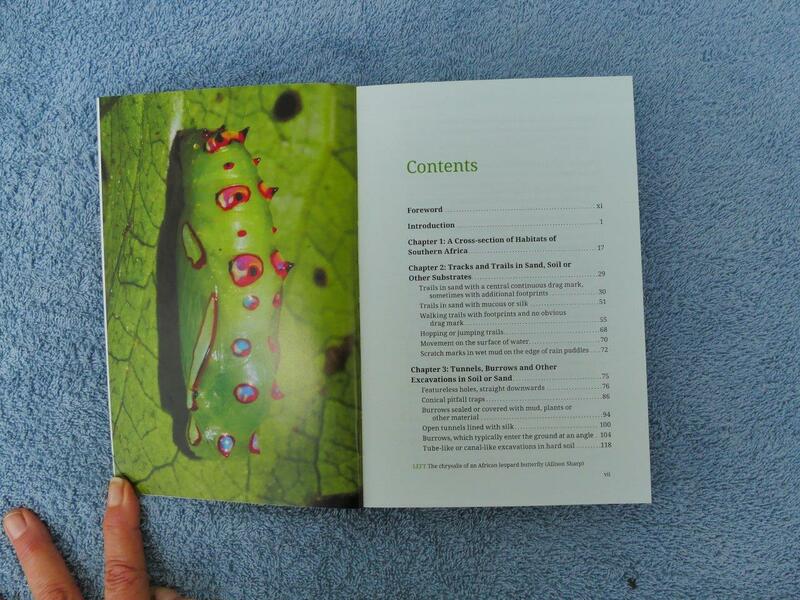 Without an index, the only way is to browse the book to find anything on that specific invertebrate. Common names, with the current scientific name, of the different invertebrates are shown. It would be nice to also include the common name in other local languages. 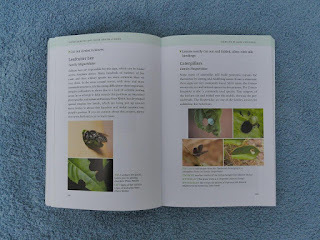 The author acknowledges that there is still a lot to be learn and discovered about our invertebrates. I am sure we can expect more books about this topic to follow, but it will be difficult to improve on the overall impact of this book. Lee Gutteridge, the author, is a well-known wild life author, nature guide and trainer with more than 25 years of experience in the bush. He has an infectious passion for, and a broad interest in, nature tourism and wildlife tracking and still trains guides and tracker teams at many of Southern Africa’s top game lodges. The production of this book was made possible with a generous donation from the Oppenheimer family. They also sponsored 250 books that will be distributed to indigenous trackers all over South Africa. The book will contribute, not only to the knowledge of interested individuals, but to experiences during game drives and nature walks with more knowledgeable guides about Southern Africa’s invertebrates. The book has 410 pages with a flexible, soft cover.